NVIDIA’s Tegra chips were amazing and useful for university and research related project back then when I was in University. It was a popular processor used in University level projects for several purposes. It seems like NVIDIA want to put an advance version of Tegra into the market for applications in Robotic market with the introduction of Jetson Nano. Jetson Nano is a $99 tiny processor that packs a power worth half a teraflops. This Jetson Nano by NVIDIA is a small yet powerful package that has 128 Maxwell cores capable of delivering 472 GFLOPS of FP16 computational power that is enough for AI-applications. A complete package of Jetson Nano will be consuming 10Watts of energy at maximum potential, and it has a 4-Core processor based on ARM A57 architecture. Not just that has 4GB of LPDDR4 RAM along with 16GB of eMMC space. HEVC is also supported by Jetson Nano that can produce wonders in only 16GB of little space. It has 12 MIPI cameras support through 3×4 or 4×2 lanes along with HDMI 2.0 or DPI 1.2 ports. Input/Output devices include USB 3.0 and a PCIe port that is capable of 4X data transfer. Developer related ports include 1x SDO, 2x SPI, 5x SysIO, 13x GPios and 6x 12C in Jetson Nano. It will be sold at MSRP of $99 while providing such enormous power to students for their projects. It contains far most processing capability compared to raspberry pie. The company didn’t support at the hardware level either because this tiny thing supports CUDA-X, which is the company’s latest implementation of its proprietary development environment. The small but powerful CUDA-X™ AI computer delivers 472 GFLOPS of compute performance for running modern AI workloads and is highly power-efficient, consuming as little as 5 watts. 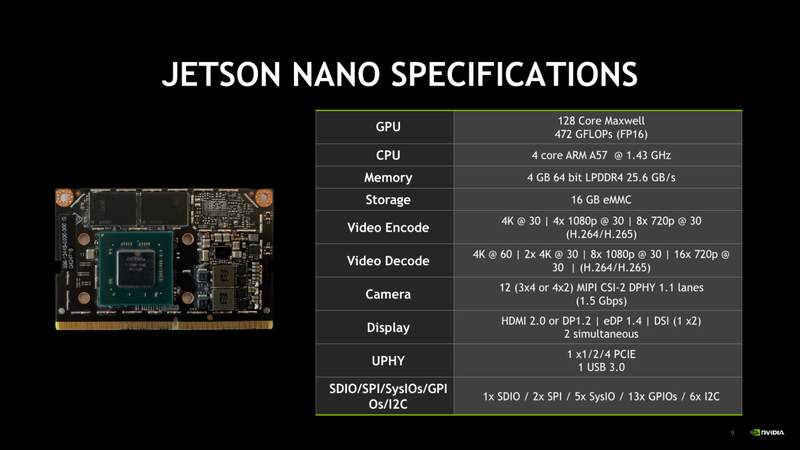 Unveiled at the GPU Technology Conference by NVIDIA founder and CEO Jensen Huang, Jetson Nano comes in two versions — the $99 devkit for developers, makers and enthusiasts and the $129 production-ready module for companies looking to create mass-market edge systems. Jetson Nano joins the Jetson™ family lineup, which also includes the powerful Jetson AGX Xavier™ for fully autonomous machines and Jetson TX2 for AI at the edge. Ideal for enterprises, startups and researchers, the Jetson platform now extends its reach with Jetson Nano to 30 million makers, developers, inventors and students globally. The power of AI is largely out of reach for the maker community and in education because typical technologies do not pack enough computing power and lack an AI software platform. At $99, the Jetson Nano Developer Kit brings the power of modern AI to a low-cost platform, enabling a new wave of innovation from makers, inventors, developers and students. They can build AI projects that weren’t previously possible and take existing projects to the next level — mobile robots and drones, digital assistants, automated appliances and more. In the past, companies have been constrained by the challenges of size, power, cost and AI compute density. The Jetson Nano module brings to life a new world of embedded applications, including network video recorders, home robots and intelligent gateways with full analytics capabilities. It is designed to reduce overall development time and bring products to market faster by reducing the time spent in hardware design, test and verification of a complex, robust, power-efficient AI system. The design comes complete with power management, clocking, memory and fully accessible input/outputs. Because the AI workloads are entirely software defined, companies can update performance and capabilities even after the system has been deployed. NVIDIA CUDA-X is a collection of over 40 acceleration libraries that enable modern computing applications to benefit from NVIDIA’s GPU-accelerated computing platform. JetPack SDK™ is built on CUDA-X and is a complete AI software stack with accelerated libraries for deep learning, computer vision, computer graphics and multimedia processing that supports the entire Jetson family. The JetPack includes the latest versions of CUDA, cuDNN, TensorRT™ and a full desktop Linux OS. Jetson is compatible with the NVIDIA AI platform, a decade-long, multibillion-dollar investment that NVIDIA has made to advance the science of AI computing. NVIDIA has also created a reference platform to jumpstart the building of AI applications by minimizing the time spent on initial hardware assembly. NVIDIA JetBot™ is a small mobile robot that can be built with off-the-shelf components and open sourced on GitHub. The NVIDIA Jetson Nano Developer Kit is available now for $99. The Jetson Nano module is $129 (in quantities of 1,000 or more) and will begin shipping in June. You can purchase through NVIDIA’s main global distributors. Developer kits are also available from maker channels, Seeed Studio, and SparkFun.